Having originally interviewed Carla back in November 2014, back then, Carla was the Event Lead for Jumps and Combined Events with Athletics Canada…she is now Lead of Olympic High Performance Development for Canada’s Athletics Team heading to the Rio Olympic Games this summer. Carla has achieved her IAAF Level 5 Elite Coach certification in Horizontal Jumps and NCCP Level 4 Certification in Athletics. Her 22 years of involvement with athletics has ranged from small club development to serving as head coach at the University of Regina, to being a two-time Olympic team coach (2008 & 2010). She is a graduate of the Coaching Association of Canada’s Women in Coaching Apprenticeship Program and is an active ChPC with Coaches of Canada. She was a writer of the New NCCP manual for athletics, a contributor to Athletics Canada’s Long-term Athlete Development program, and is a Master Learning Facilitator for all levels of the NCCP. Author: Andrea Katz is the founder of Fit Communications, a Canadian based marketing and communications company. Andrea graduated from the University of Manitoba (Canada) with a Bachelor of Arts double major in Psychology and Sociology and continued her education in the business world. With a lifetime commitment to sport and fitness, Andrea now puts her talents to use in the marketing of sport and fitness. Have you ever had the opportunity to talk with someone over the phone or online and get so excited about everything they have to say you almost want to jump through to phone to hug them? Have you ever had the opportunity to talk with someone over the phone or online and get so excited about everything they have to say you almost want to jump through to phone to hug them? THAT is how I felt when interviewing Carla Nicholls, Lead of Olympic High Performance Development for Canada’s Athletics Team heading to Rio this summer. The amount of positive energy she exudes into the world is exasperating. If our athletes are in her hands, watch out world – Team Canada is coming! “I have been blessed with a passion, a passion for Athletics and I can’t get that passion to go away!” says Nicholls, who has been coaching various teams in Athletics for over twenty years. Carla is heading to her third Olympic Games with Team Canada this summer in potentially two different capacities. 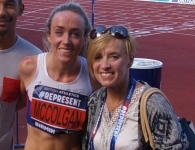 First, as the (solidified) Technical Lead for Athletics, and the potential coach for a Parathlete she is currently coaching who has his sights set on Paralympics. He is a T44 below knee amputee. As Technical HP Lead, Carla is working alongside Team Canada’s Head Coach to ensure all athletes and coaches’ high performance needs are in place and taken care of. Carla has been part of the “2016 Program” since 2010 when she first became the High Performance Olympic Development Lead. “It is exciting for me to see all the athletes we had identified in 2010 and worked very closely with since to prepare for these games. It creates a full circle for me as a professional working within Athletics Canada. It would also be extremely exciting for me for my Parathlete to be named to the Para Rio Team,” says Nicholls. And with Carla’s passion – I have no doubt this will be one of the most successful Games to date for Canada. Carla was one of the mere 11% of female coaches at the 2012 Olympics, and is set to help motivate other women in Canada to reach a high level of coaching for our country’s best athletes. In the same breath, she recognizes this road isn’t always easy. Carla notes there are several different layers of commitment and sacrifice that a coach or team member needs to engage in at one level or another. Having a supportive and loving family and friends surrounding you is a must, especially if you are a parent. The support of each sport’s National Sport Organization (NSO) is imperative, and Carla notes Athletics NSO is on top of their game. In terms of barriers for being a High Performance Coach in Canada, for Carla it is her own guilt of leaving her children for extended period of times. “To continue to accelerate within my profession, the pressure to be away from home increases. This is a continuous struggle for me and I am sure many female coaches and sport leaders,” says Carla. Nicholls notes that the need for female mentorship is critical as women often become isolated and experience their own individual struggles within their profession. The more successful female sport leaders we have in Canada who achieve their professional goals, the more female mentors women will have. With mentors comes the teaching and learning of how to over come barriers. many of her life successes to the sport. Carla has numerous mentors who have helped her stay on track, and to be the best version of herself possible. “The most significant piece of advice is to be able to recognize in someone their value and their positive influences and how you can learn from them. We sometimes get too focused on ourselves and miss so many important aspects that are staring us right in the face,” says Nicholls whose positivity is truly infectious. As I continued to speak with Carla it truly brought a level of excitement beyond measure for me that I have not experienced before leading up to an Olympic Games. I am a huge fan of sport, and absolutely love watching athletes push their bodies and souls to such incredible places. Her ability to motivate and electrify is remarkable. She gets so excited when talking about sport and her athletes, she is vibrating. Carla’s big dream for her athletes is more than just an Olympic medal. She wants to see them develop into successful adults no matter what they choose in life. “Success would be defined as having enough self-confidence to lay down goals and dreams or set challenges and not be scared to tackle them no matter what the outcome may be,” says Nicholls. Wishing Carla the best of success at both the 2016 Olympic and Paralympic Games! Good luck. Thanks for all your hard work !! !